Since 2007 I have had the pleasure of participating in SAP’s Influencer Program. This group of digital influencers are invited to attend events like SAPPHIRENOW (SAP’s huge annual ecosystem conference – think MacWorld, but SAP) and TechEd (smaller, regional events with a more geeky bent) to see new products, speak 1:1 with senior executives and generally get a feel for what’s ahead. I enjoy these events tremendously and always get a ton of value from them. So what was the big highlight for me this year? Interestingly, it had very little to do with SAP product and everything to do with people. A couple of months back I got a call from Stacey Fish in SAP Global Communications, asking if I would be interested in moderating a panel discussion among senior women in technology about diversity. 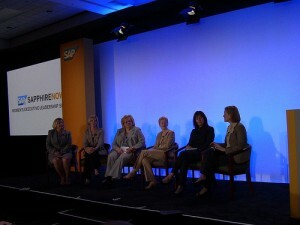 I was flattered to be asked, and last Tuesday I sat on stage with Janet Wood, SAP EVP, Sandy Rasel, CIO of Purdue Farms, Kathi Hanrahan, a senior delivery executive at IBM (pinch-hitting for Jeanette Horan, who was just named CIO of IBM) and Kristen Blum, CIO at PepsiCo in front of an invite-only audience of about 200 women in technology. Topics covered included the price of professional success (well set up for us by SAP Board Member Angelika Damann’s keynote), the importance of mentoring and networking (two areas critical to achieving a senior leadership role), and how our perception of ourselves in the workplace becomes reality (ie: you make your own success). Some of the best questions came from the audience, one of which prompted Janet Wood to quote Madeline Albright: “There is a special place in Hell for women who don’t help other women,” It was a controversial topic that I would have liked to explore (Is it really a “thing” that certain women “eat their own”, or is it simple professional jealousy, something both men and women exhibit?) but it was a touchy topic; good fodder for next time! Overall, it was an amazing opportunity to hear the experiences of women who have achieved extremely senior roles in male-dominated fields, and it was personally a pleasure to have the chance to share the stage with such an accomplished group. Ahead of our session, SAP’s Natascha Thomson and I talked about the importance of diversity (of all kinds) in the workplace and its impact on innovation. Here’s the video.